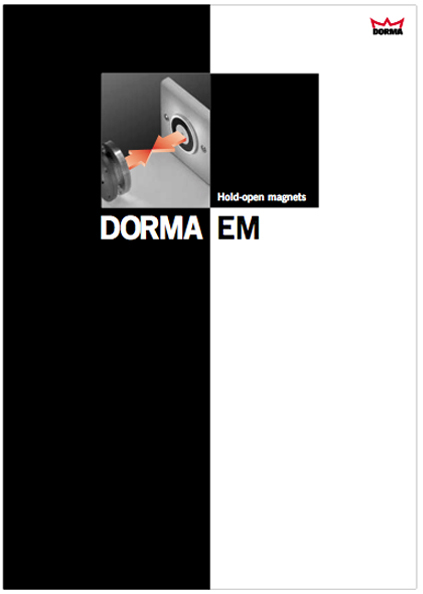 Economical package for controlled release and closing of doorsThe DORMA EM Series door holders are composed of a door mounted catch plate and a floor- or wall-mounted electromagnet. 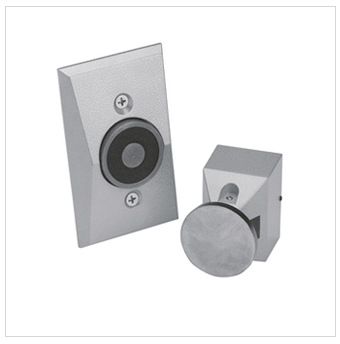 This series serves as an economical package for use in conjunction with DORMA door closers whenever controlled release and closing of doors is necessary for safety or convenience such as in hotels, hospitals, and nursing homes. Superior reliabilityThe EM Series magnets offer superior reliability with built-in protection and low residual magnetism so they release easily even in applications meeting ADA requirements with minimal spring force door closers. Several mounting methodsBrackets are not required for recessed, flush, or surface mounting. The catch plate on the door features a ball-shaped pivot arm for adjustability to further ensure perfect alignment. Optional extension rods are available to accommodate greater distances between the door and wall.